Our house is actually an old farmhouse that used to manage the 60 acres around us. The original owners left a packet of information and old photos with a pretty complete history of the house & property that's been passed down from owner-to-owner. 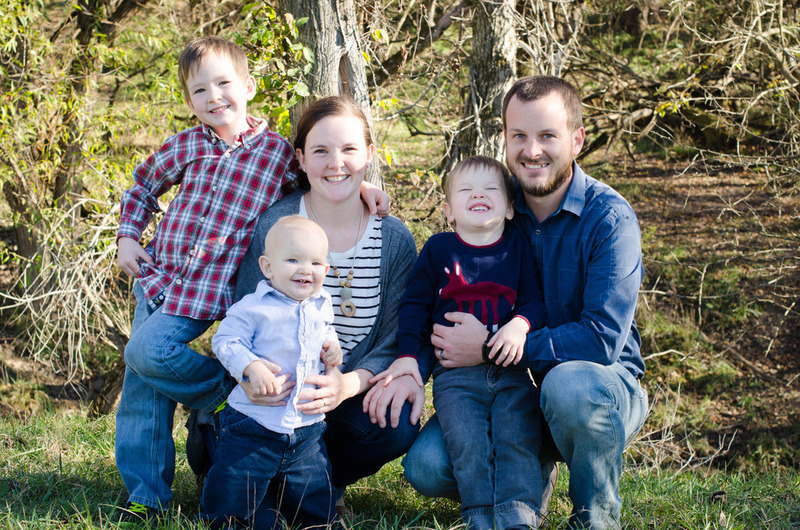 It's pretty cool and we plan to add a few photos of our own! 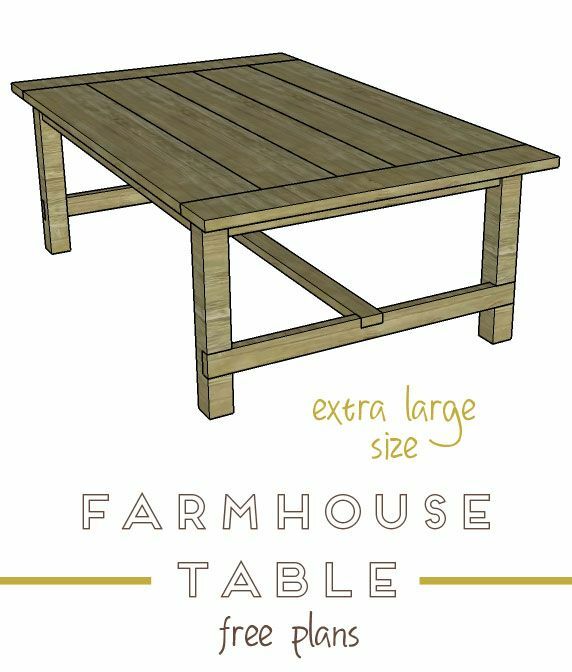 With our home's history, a traditional farmhouse style table seemed like a fitting choice. 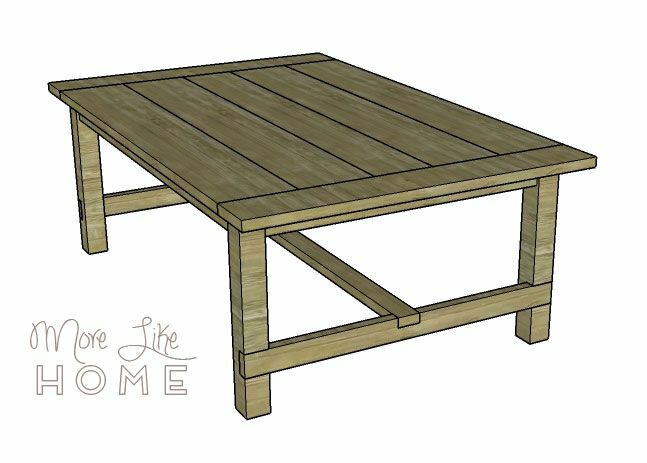 After looking at dozens of table designs, I finally narrowed down my favorite features: I like it simple, I like stretchers, and I like wide planks for the top. 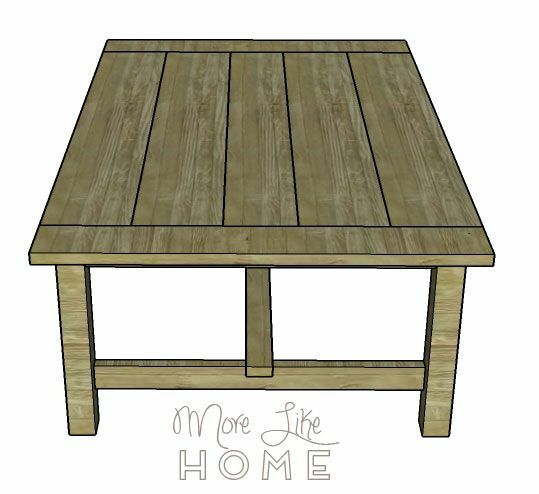 And that landed us with this design (based on Ana White's farmhouse table with the size modified). 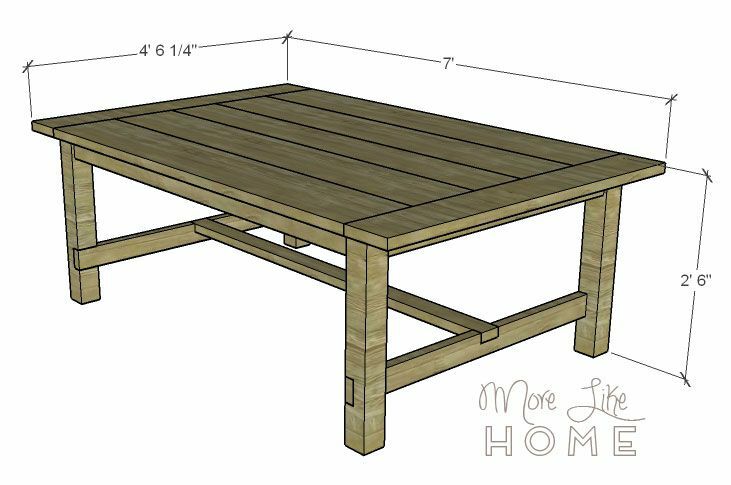 It's a little longer than most tables (7') but it's also over 4' wide, giving us plenty of space to fit serving dishes or spread out with art supplies. 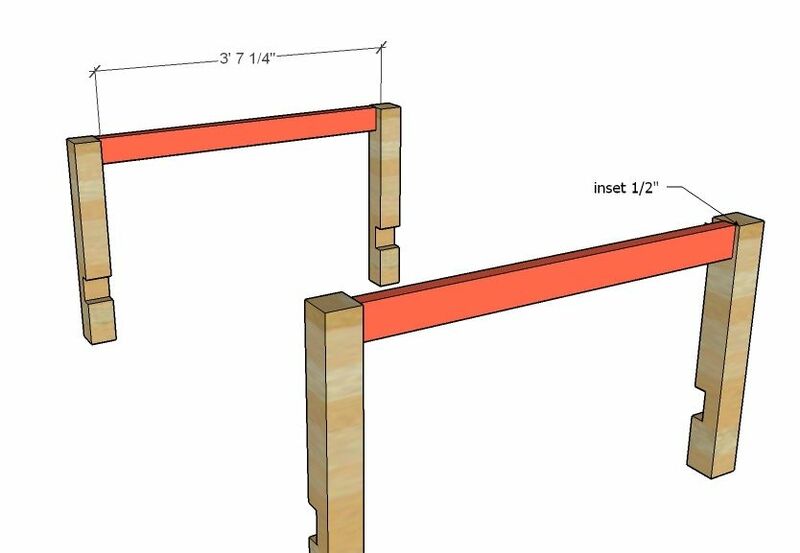 A table built from these plans will be roughly 54 1/4" wide x 84" long x 30" high. 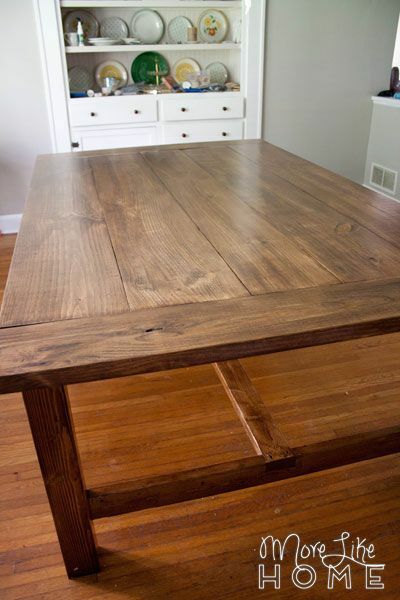 It will vary slightly if you shave the rounded edges off your tabletop boards like we did. We started by assembling our tabletop. 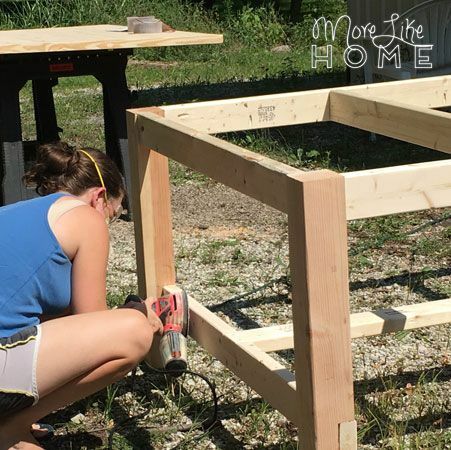 Before we put the boards together we ran them all through our table saw just to take off the rounded corners so the edges would sit flush together with no valleys between the boards (more on that and other table top building tips here from Ana White). 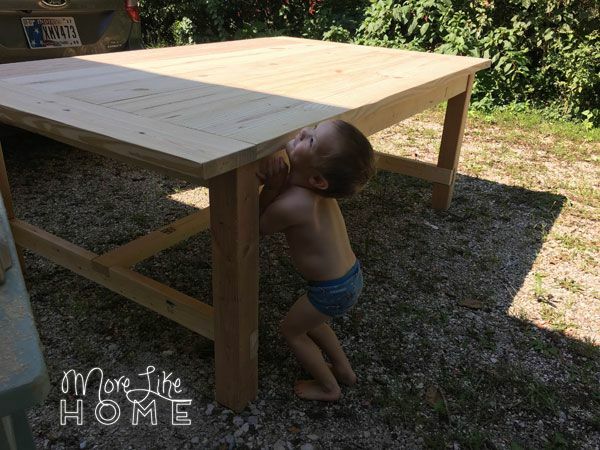 This takes off roughly 1/4 - 1/2" from the width of each board and will affect your overall size, so if you do this you'll need to adjust your measurements for the rest of the table. No project ever goes as smoothly as we hope. 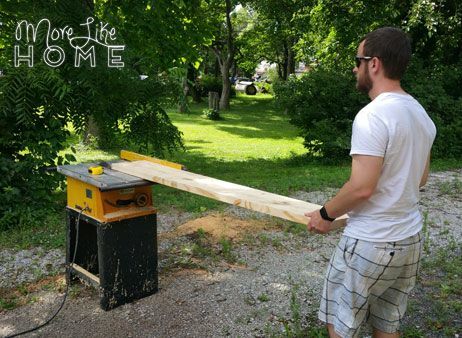 After cutting all our boards, we realized something was off with the table saw and every single one had come out wonky. And we had to redo the whole thing. It was so disheartening it took us a few weeks to get back at it! Next we notched out the legs (D). Meaning husband notched out the legs. He's the best at doing the worst jobs. 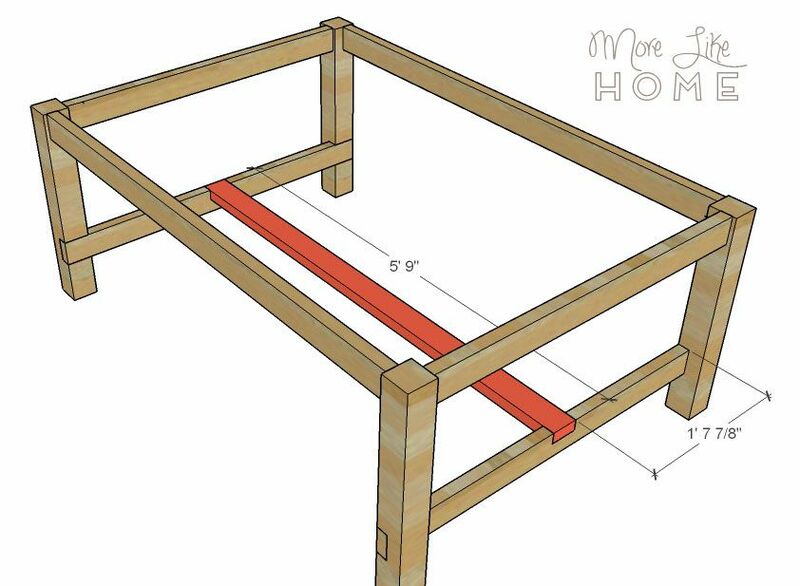 Each notch should start 6" above the bottom of the leg. The notches should be 3.5" tall, and 1.5" deep. Just the right size to fit a 2x4 in the opening. Then he chiseled out the remaining slices. Next we drilled pocket holes facing the top edge of the end aprons (E). 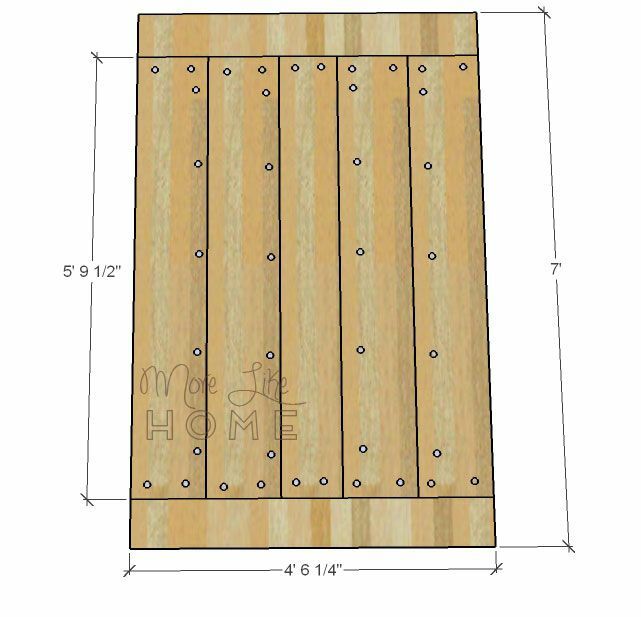 We did 5 holes along each apron, so we'll get a screw into each of the five tabletop boards. Use each of the aprons to to connect two legs together. 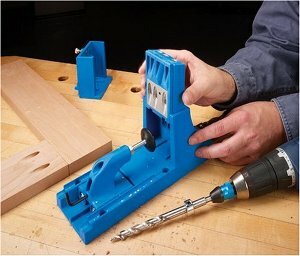 Decide if you want the notches on the legs facing in or out (more on that in a minute), then use the Kreg Jig to make pocket holes in the ends of each apron. Inset the aprons 1/2" from the outside face of the legs and attach them with pocket hole screws. 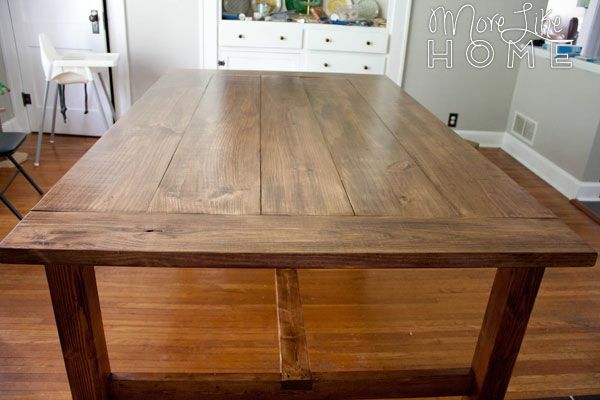 We made our table with the notches turned in toward the center of the table. 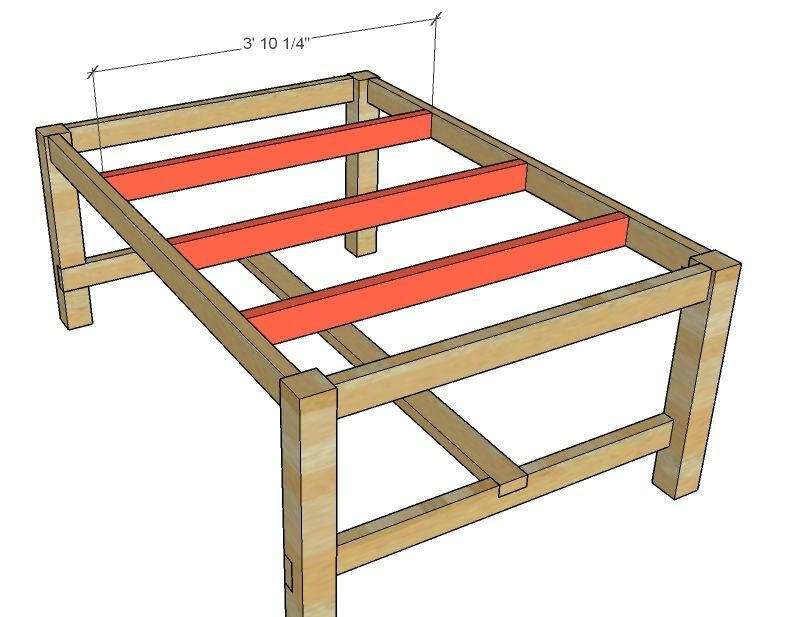 But you can also turn them to the outside for a slightly different look (you'll need to adjust the length of your center stretcher for this). 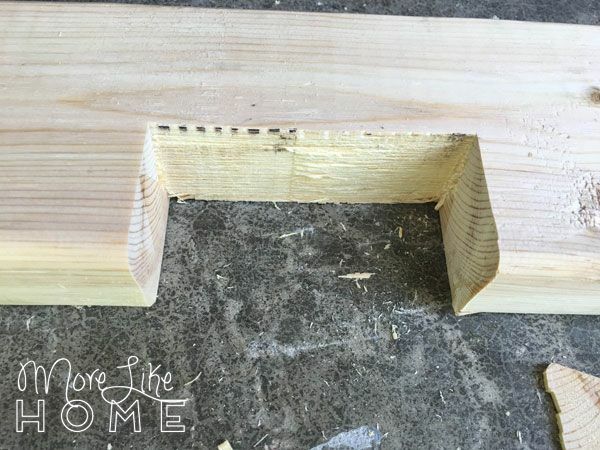 Make pocket holes in the ends of the side aprons (F) and use them to connect the two leg sections you just built. These aprons are also inset 1/2" from the outside face of the legs. 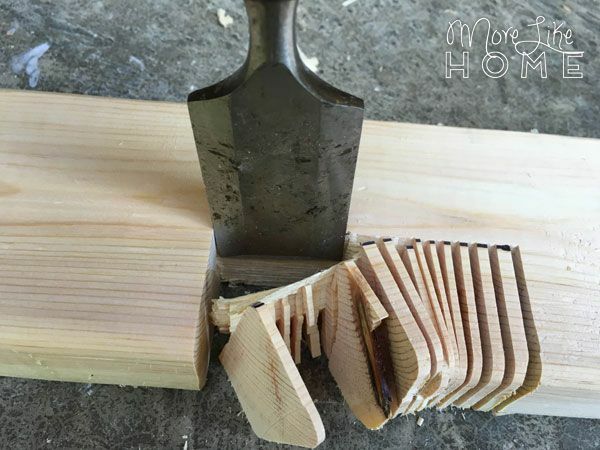 Then we Husband notched out the side stretchers (G) the same way he notched the legs. This notch is centered with 23 3/8" on each side, and the notch is 3.5" wide and 1.5" deep. 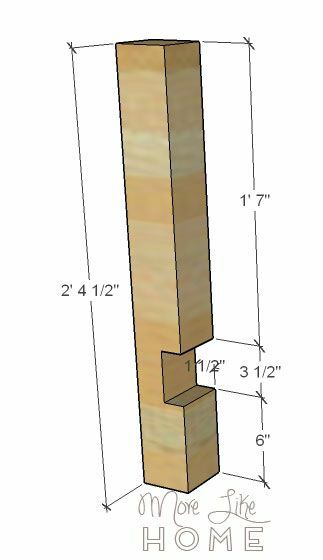 You could also use a 4x4 for the stretchers instead for a beefier style, if you notch the ends of the stretcher to fit flush into the leg notches. Fit the side stretchers into the leg notches. Attach them with 2.5" screws by drilling through the stretchers into the legs. We did two screws per leg. 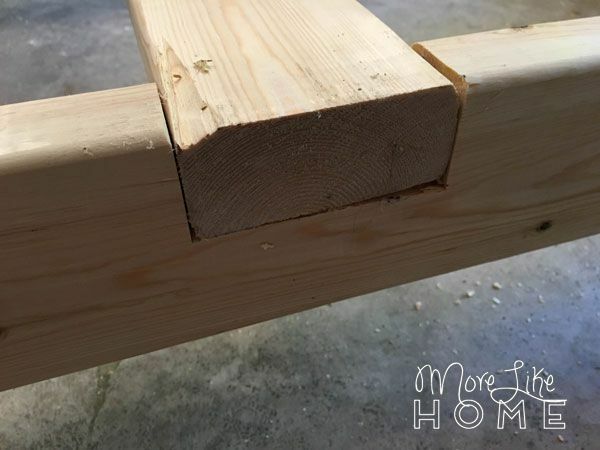 The center stretcher (H) should fit right into the notches in the side stretchers (remember to double check the length before you cut, especially if you turned the legs to face out). We attached it with 2.5" screws by drilling down through the center stretcher into the side stretchers. The notches are extra work (you could alternatively use a Kreg Jig to attach the stretcher right into the side of the legs) but it really adds a cool detail to the style. 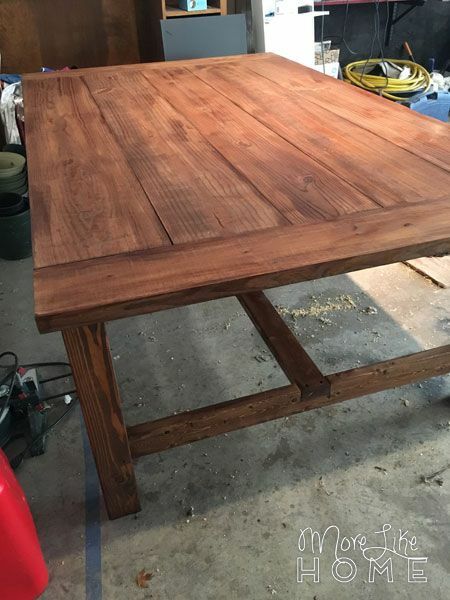 We plan to keep this table for a very long time, so it was worth it to do it right and put in the work for a table we love! Then we added the tabletop supports (I). Again we drilled pocket holes along each support board before we installed them (but the portable base makes them easier to add later if you forget). 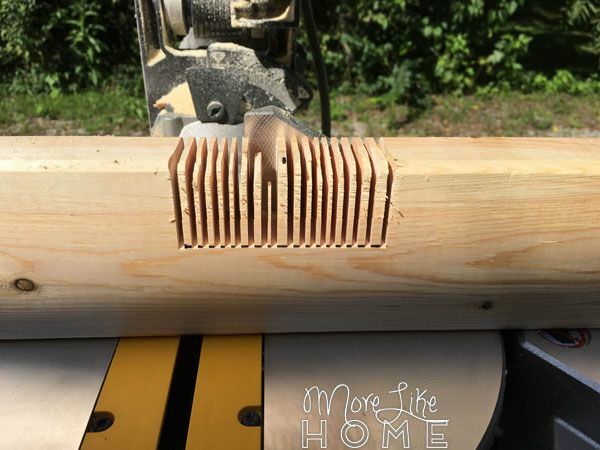 Five holes per support so we get a screw into each tabletop board. We also made pocket holes in the end of each support board, then attached them with pocket hole screws into the side aprons. I didn't measure these too closely when I spaced them, I just made them even-ish. 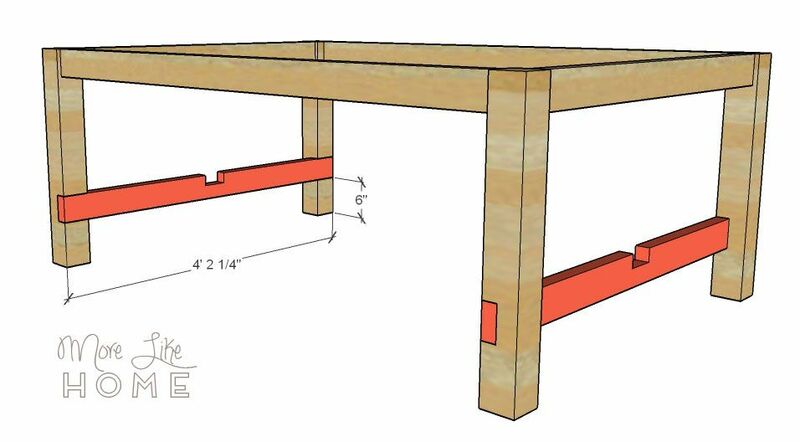 Now that your table base is complete you can attach the top. Check the the base is square by measuring corner-to-corner diagonally both directions (the measurements should match). 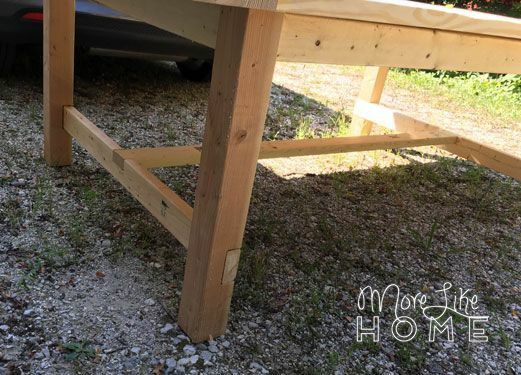 Then center the top on the table base with even overhangs on the sides and ends, then use the pocket holes in the aprons and support boards to attach the top from below. So with the top and base still separate, I sanded everything down. I keep saying it because it's true - sanding makes an enormous difference in the finish of your final product! Don't skip it! I spent a long time on this big guy, starting with a 60 grit paper, then 120, and finally 220. This was the most time I've ever put into sanding, and it paid off. 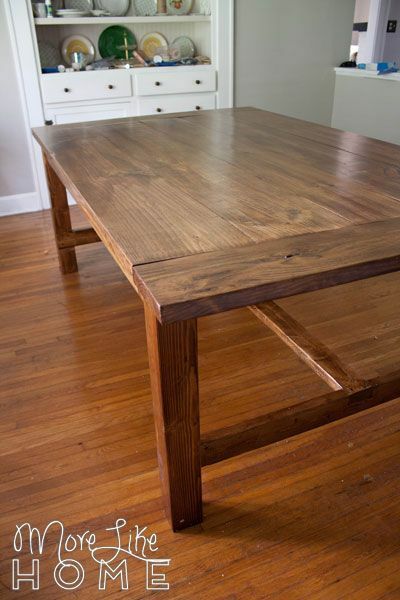 This table is so smooth. Meanwhile, I'd been trying out a few stains on a scrap piece of wood to see which I liked best. 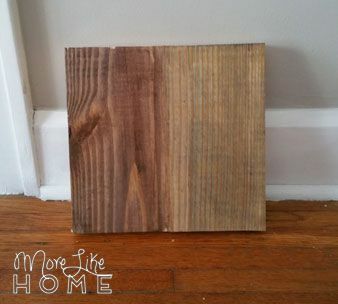 On the left is Minwax Coffee, and the right is Minwax Weathered Oak. The verdict = I hate them equally. And I am so glad I tested them instead of jumping in. Our floors have a slight orangey tinge that I'm not used to working with, and these guys did not play very well with their new friend Floor. Then I picked up Minwax Early American. 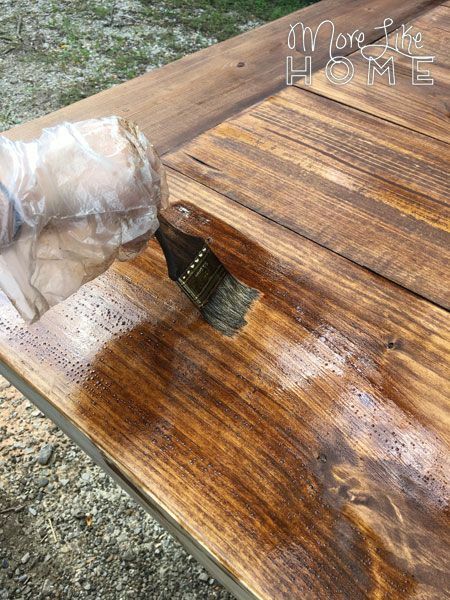 My SIL suggested it and she has a good track record with choosing stain (we also copied her when we chose our deck stain). Sure enough, it was a winner and I got to work staining this big guy. It was such a hot sunny day, the stain was soaking right in and drying so fast there was barely anything to wipe off. 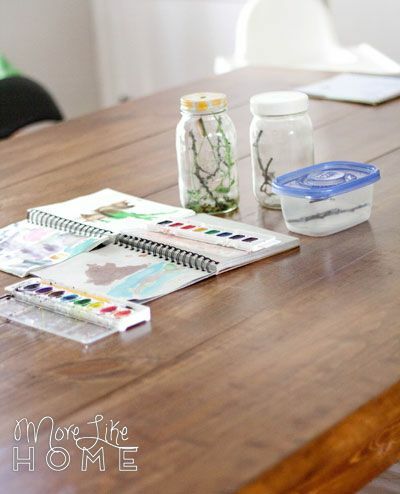 It actually gave the table a deeper color that I love. While it was wet it looked pretty yellow and I was all "OH NO I HATE IT WHAT HAVE I DONE." But guys, wait for the stain to dry. I loved it again once it dried out and calmed down. I let it dry overnight in the garage, then I hit it with three coats of a satin polyurethane. We hauled the two sections inside and assembled them in the dining room. I'm so glad we left it in two pieces to move, because still we barely got it in there. With much sweat and a few sore muscles. We started with the base, and it was heavy but we knew the top was even heavier. The first time we tried to lift the top I barely budged my end. But then the desperation set in and I was all "One more try and let's just do it this time." Because apparently you're stronger if you just say you will be. And somehow we got it off the sawhorses and up the stairs and in the door and didn't even step on one single child. Please instead invite a couple friends over to help you move it, k? Just pay them in desserts and you'll be good. Then we promptly left home for two weeks, which was a perfect chance for the finish to cure before any little boys got their hands on it! This big fella should give us room to spread out for years to come. 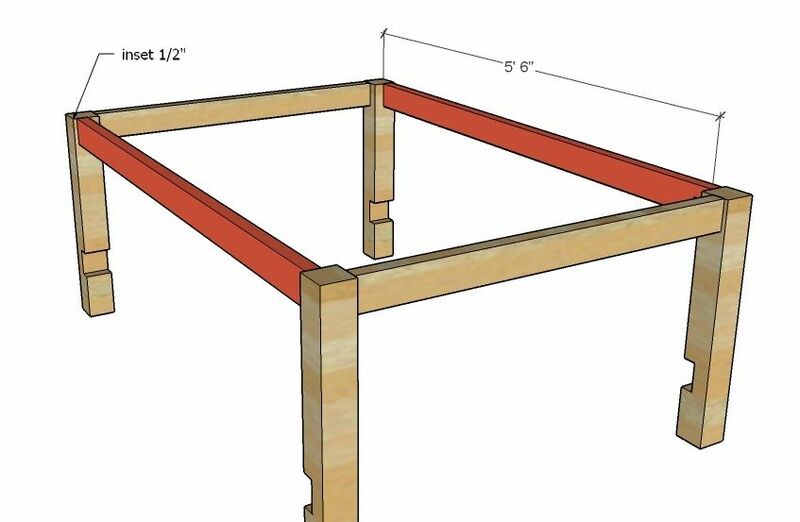 We plan to add long benches down each side, and can fit two chairs at each end (bench plans here!). We'll be able to seat 12 easily, and probably squeeze in a couple more when needed. Plus there's still enough room in there to add a card table at the end if we're really getting crazy. 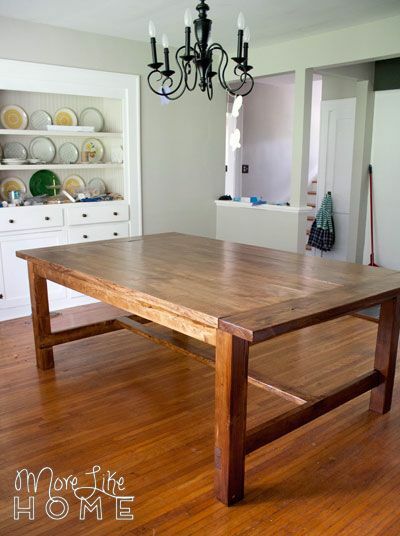 And that's the story of our big super-heavy never-lifting-it-again farmhouse table. What are YOU building? Beautiful table. Love everything and plan to have hubby build it. Pinned for later. thanks. 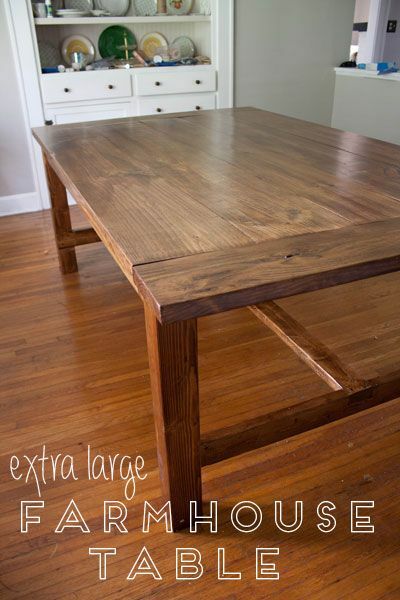 I love this table and also pinned to build it a little later. Awesome. 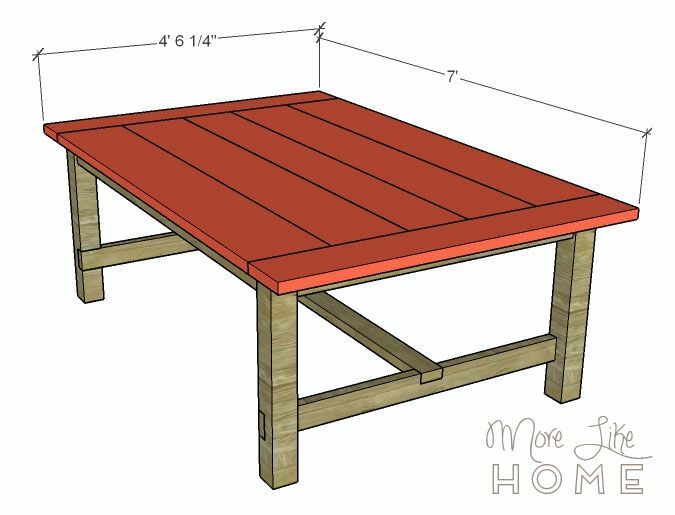 Did you build the benches yet? I'm hoping to have the plans ready to post next week!